TRAPPIST-1e: The fifth planet of the TRAPPIST-1 system, consisting of 7 earth-sized planets, three of them orbiting probably in the habitable zone of the host star, a tiny and dim red dwarf, 40 lightyears from earth. We are standing at the border of a sea near the terminator of this tidally locked subterran world. The newest researches suggest, there may be still water on this planet older than earth. The never rising or setting sun appears four times bigger than the sun on earth, nevertheless it’s dim. For human eyes it’s about as bright as twilight with the sun clearly under the horizon. You can gaze into the star’s disk for a little while, perhaps seeing some big sunspots, but it isn’t very pleasant. In the dark sky two other planets (b and c) are visible in the field of view of your position, but there are two more planets observable in the sky. 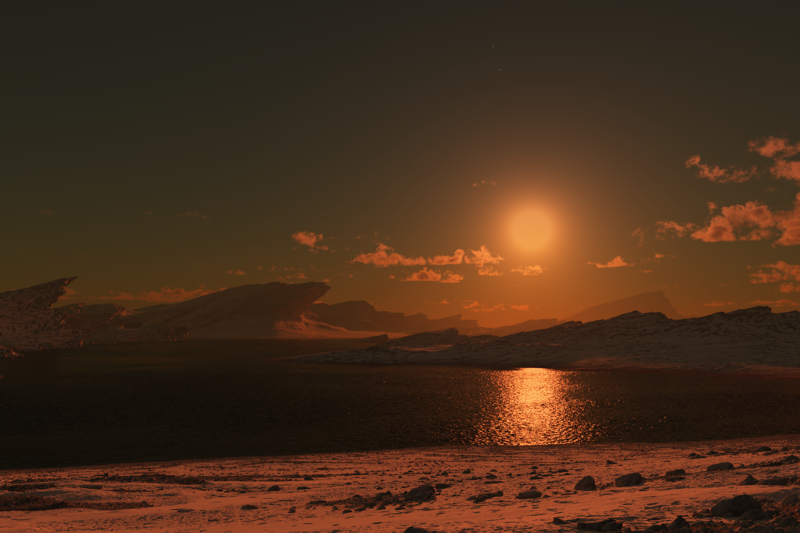 Rendered in Terragen 4, postwork with Pixelmator. Impressive work! Sure makes you wonder what's out there -- that's an interesting solar system! I don't know how I missed this! I love the rock formations!